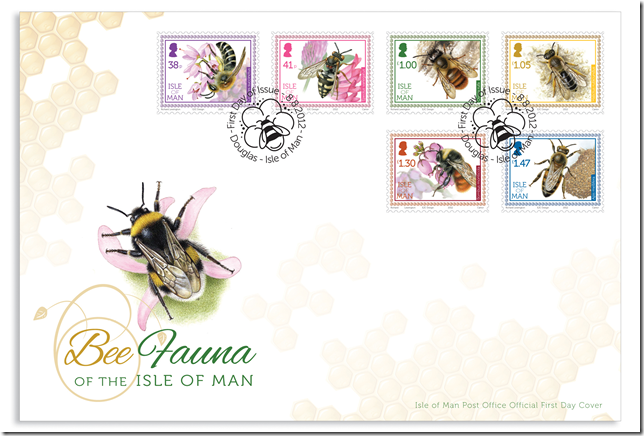 This latest release from the Isle of Man Post Office gives us a fascinating insight into the busy world of the humble bee. The Island attracts approximately fifteen species of bumblebee and fifty seven varieties of solitary bee which represents a thriving community on the Isle of Man, working in various locations from scenic mountainous landscapes in search of local blueberry and heather to the Island’s dramatic coastline fringe, where many bees frequent the Ayres and the soft cliffs of Ramsey Bay. Solitary bees are less familiar to us and are so named because there is no worker caste and they refrain from working in colonies, unlike honey bees and bumblebees, although they can form large nesting aggregations. Their names are likely to reflect some aspect of their lives, such as the Bilberry Bumblebee, or the Cuckoo Bee who wastes little time building a nest and sneaks its eggs into the nests of others, where they deliberate eliminate any competition so as to covet the nest’s provisions. In tandem with this healthy population on the Island bee keeping remains a thriving industry with one hundred beekeepers members of the Isle of Man Bee Keepers’ Federation which is affiliated to the BBKA. And just to make this stamp collection extra special each of the delightful illustrations has been printed on honey-scented paper!